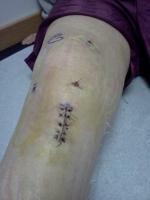 This is my 2nd ACL reconstruction surgery and I know from last time that I want to get the screw removed. Last time I waited almost 8 months between reconstructive surgery and screw removal. Due to insurance deductible reasons, I need to get my screw out earlier this time. It's been 4 months and 10 days since reconstruction surgery, is this too early to get the screw out?